The likelihood of success in the market is greatest when you consider a product from as many perspectives as possible in the design phase. This is exactly where the success of the Eindhoven-based design agency VanBerlo lies. Enjoying success abroad as well, using the (southern) Dutch polder mentality to engage stakeholders in dialogue with each other. And, as it happens, about a collection of polystyrene forms. 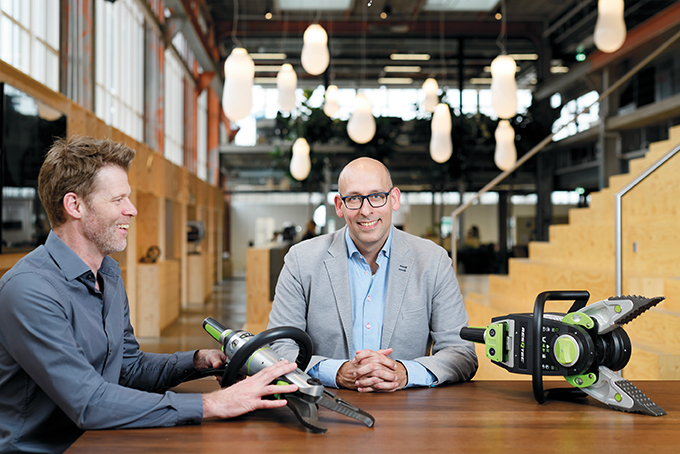 A conversation with CEO Thomas Paulen and one of VanBerlo’s innovation strategists, Ivo Lamers. In that 360-degree perspective lies a large part of the success of VanBerlo, which has built a reputation that extends far beyond Europe. Because that perspective is often lacking within the customer’s company. ‘B2B often involves technologically complex matters. All your energy is invested there. That is why we always ask: ‘Why would this be a success in the market?’ By their very nature, larger companies usually consist of silos erected around the ivory towers they occasionally inhabit, adds his colleague and senior innovation strategist, Ivo Lamers. And that is when bias rears its head. ‘There may be times when a technological innovation is based on a customer complaint that has made its way through six echelons to the CEO, for example, but if you ask other customers about it, they don’t recognise it. So, we always look into what the actual relevance is for the end-user, for that operator in China.’ Paulen jumps up and pulls two pairs of hydraulic shears – firefighting tools for cutting open crashed cars, among other things – out of a cabinet. ‘When we were doing market research on this, we talked to firefighters. Not about the technical specifications. Or about how much pressure you can place on the jaws; neither of those things seemed to be important to them. They were more interested in knowing whether they could hang it over their shoulder so they could have their hands free. Or whether they could use it with one hand. That is why this tool has become a success on the market’, he says, pointing to the small pair of shears, which also happen to be a lot lighter. ‘That suppliers have to be brought on board early on is something they understand well at ASML, for example, where they pull in suppliers at an early stage. Sometimes literally’, says Thomas Paulen. ‘It can be pretty tough to bring the worlds of high-tech and industrial design together. Technological SMEs in particular often fail to recognise the power that designers can add to their technology by putting the user first’, says Martijn Paulen, director of the Dutch Design Foundation and organiser of the Dutch Design Week (DDW). The purpose of the event is to draw as many sophisticated visitors – clients, development partners and journalists – to Eindhoven and to introduce them to the industrial designers and their work. Given the growth in visitor numbers from 200,000 in 2012 to 335,000 in 2017, 20 percent of which goal-oriented professionals from abroad, the event appears to become increasingly successful in achieving this purpose. Only design and technology are able to achieve that human-centred innovation market is asking for. And the DDW is bridging the gap between those two worlds’, says Paulen. ‘I see quite a few SME owners who consider the week an ‘enjoyable outing’, only to discover upon arrival that there are designers showing off their designs, which means potential business for them. Our chief sponsor ABN Amro also made that switch. The bank started its sponsorship from the same cultural angle they chose to back theatre financially. These days, however, the bank is inviting many B2B customers from sectors such as high-tech, food and health care. Link Special South Netherlands, you can read this magazine on line. This year’s edition of the Dutch Design Week is held 20-28 October.